You can limit who can create a fundraising page on your fundraising site with our Invite Code feature. This feature is found under "Peer to Peer Fundraising" in your Settings. To enable an invite code, input a code that fundraisers must use to create a fundraising page. 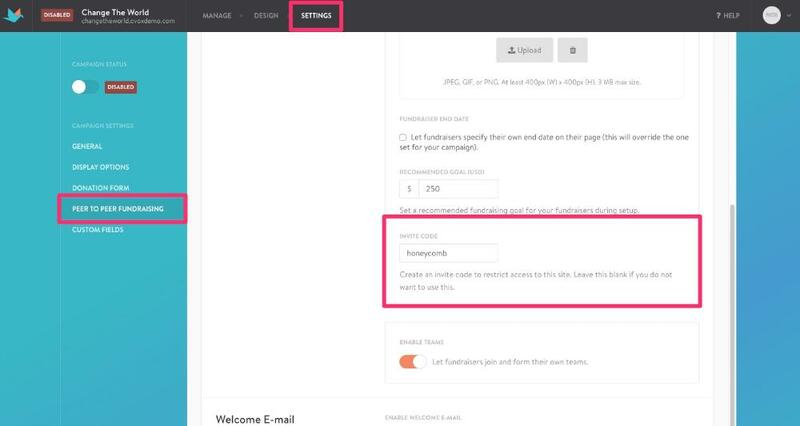 This option helps you filter who can create a page as well as the number of people that can join your campaign. For example, you can use this option if you charge a sign-up fee for supporters to create a page or want to roll out fundraising pages to a limited audience before making it widely available. You can switch these options at anytime. In addition, you have the ability to deactivate fundraising pages at anytime too.